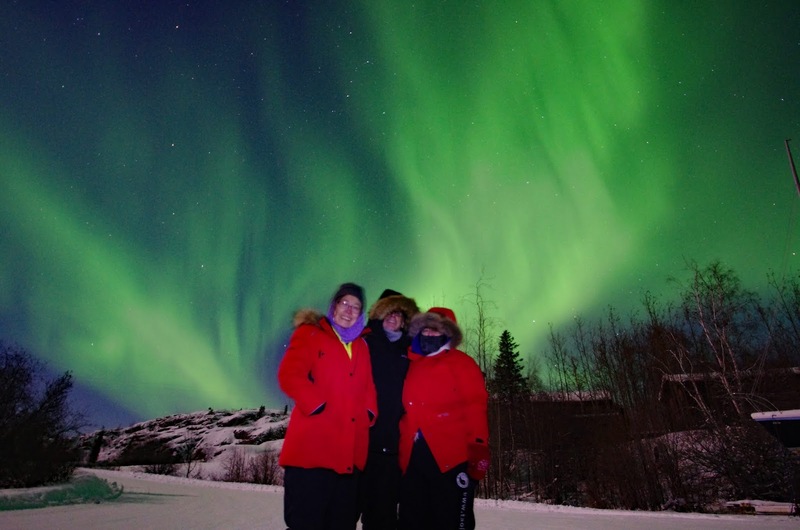 Grobetrotting With Jeff: Yellowknife NWT & the Northern Lights - It's an Adventure! 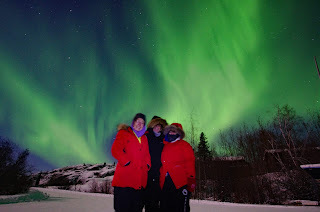 Yellowknife NWT & the Northern Lights - It's an Adventure! I’ve always wanted to see the Northern Lights. I almost saw them when I was 15. 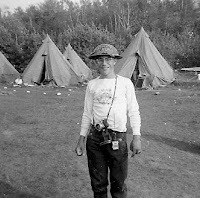 I was at a summer camp near Sudbury, Ontario. It was the last night and the tents where we’d spent the previous eight weeks were packed up and stored for the winter. We would be spending our last night under the stars. Being the last night, the camp counsellors weren’t being terribly observant which allowed many of us to slip into our girlfriends sleeping bags. I was busy trying to get to second base – which was difficult with two people being shoe-horned into I ended up on top and was busy trying to figure out the mysteries of the female bra. I’m reasonably mechanical, but I had come to the conclusion that it was like the stone that blocked Alibaba’s cave – you needed a magical word to get it to open. a sleeping bag made for one. I figured it was just another excuse to end my interminable groping, and ignored her. It turns out it was the Northern Lights. So I never got to see them, nor get to second base. Flash forward a half century. I’m proud to admit that in the interval I did manage to get to second base, but never saw the Northern Lights. I saw comet Hale-Bopp in 1997, and the solar eclipse of 2017, but was missing seeing the Aurora Borealis so I could complete the Atronomical Trifecta. This winter I decided to rectify that. When I mentioned it to my buddy Tom, who had accompanied me on several other adventures he immediately signed on. Travelling with Tom is always… interesting. (read my Amazon rip). 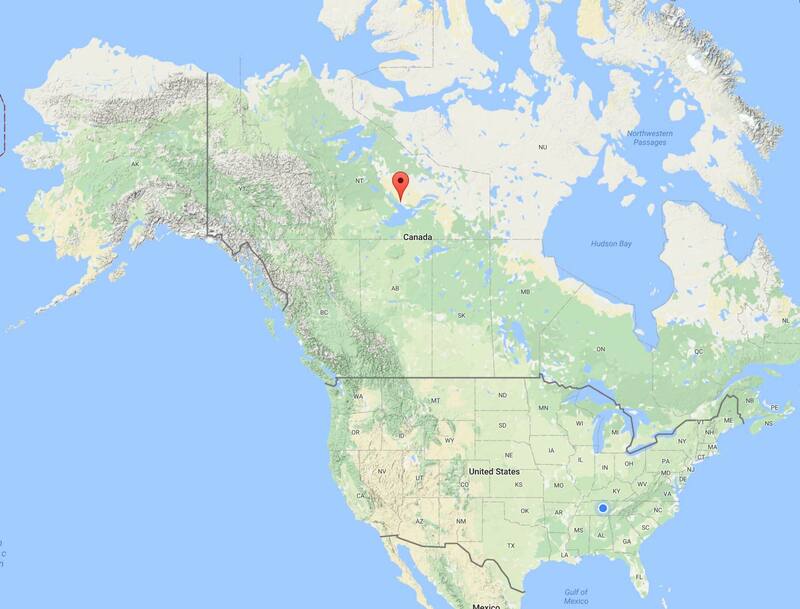 For those of you who don’t know where Yellowknife is, it’s in Canada’s north. 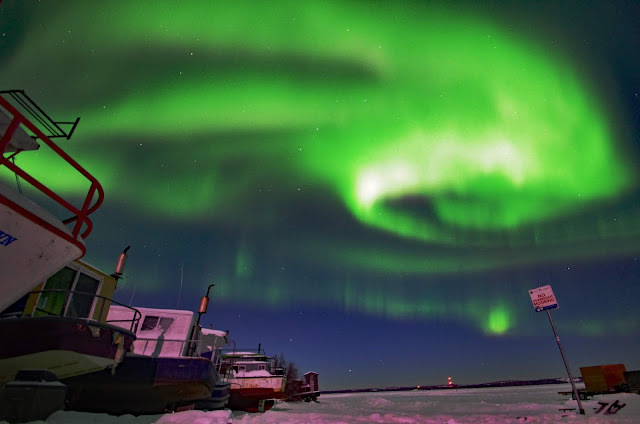 It lies on the north shore of Great Slave Lake about 250 miles south of the Arctic Circle and has a population of just under 20,000. When I announced to my wife that I was going to view the Northern Lights she surprised me by telling me it was also on her bucket list. Even though we’d been married 40 plus years I’m still learning stuff about her. Tom mentioned his partner wanted to go, so there was a foursome. 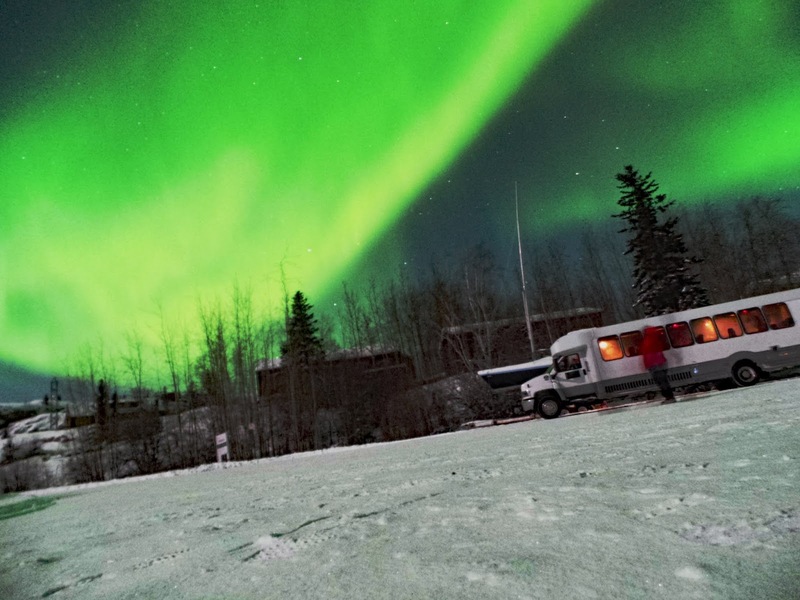 I booked a three-day two-night tour on line with Northern Lights Tours. I’d sent emails to a few tour company’s but they were the only ones who got back to me. They answered all my questions and seemed to have excellent feedback on TripAdvisor. 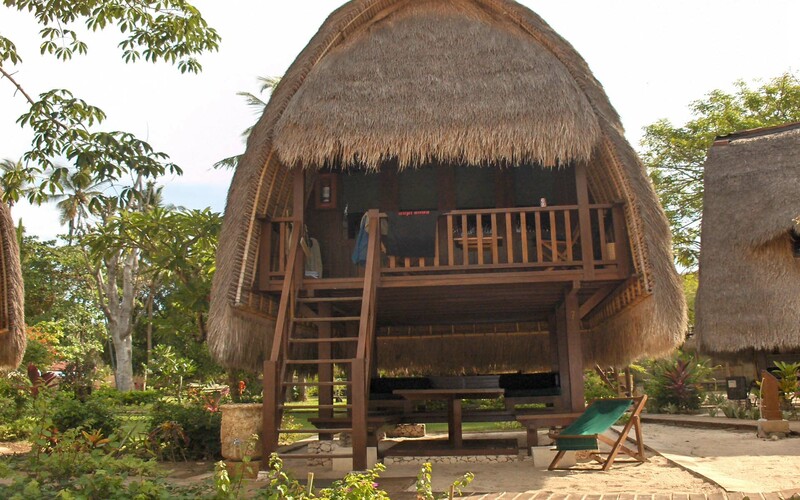 Our package included transfers from the airport, hotel, clothing and two nights viewing. Viewing the Aurora Borialis is a bit like going fishing. There’s no guarantee you’ll see them. First of all the weather might not cooperate, and if the weather does cooperate they might just be a no-show. I was told we’d have about a sixty percent chance of seeing them during our stay. As our trip drew closer I began to monitor the weather. The long range forecast was unclear if it would be cloudy or clear. 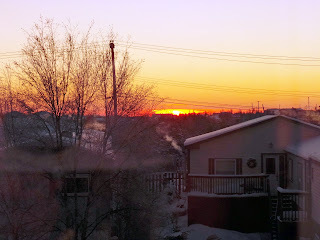 One thing it was clear about – it was going to be cold – very cold! Minus 37 degrees Centigrade (minus 35 Fahrenheit). With windchill it would feel like minus 51 (minus 60 Fahrenheit). Flesh freezes at that temperature if you even think of going outside! In case you’re interested the average temperature of Mars is minus 55 C. So if you didn’t make the cut for Jeff Bezos Mars mission and you want to know what it’s like on Mars, just visit Yellowknife in January. Getting there is relatively easy. It’s a two-hour flight from Calgary on Westjet or Air Canada. I was getting concerned when we arrived in Calgary as it was snowing, and it was cloudy all the way into Yellowknife. As we arrived, the captain announced it was a balmy minus 35 degrees (not counting the windchill factor). As it was a small plane and a small airport there was no gate. 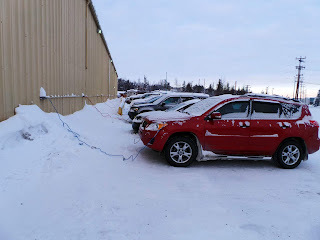 We deplaned outside and made a quick dash into the airport where we found our driver, Joe, and guide/photographer, Tracy, waiting for us with our cold weather clothes and boots. 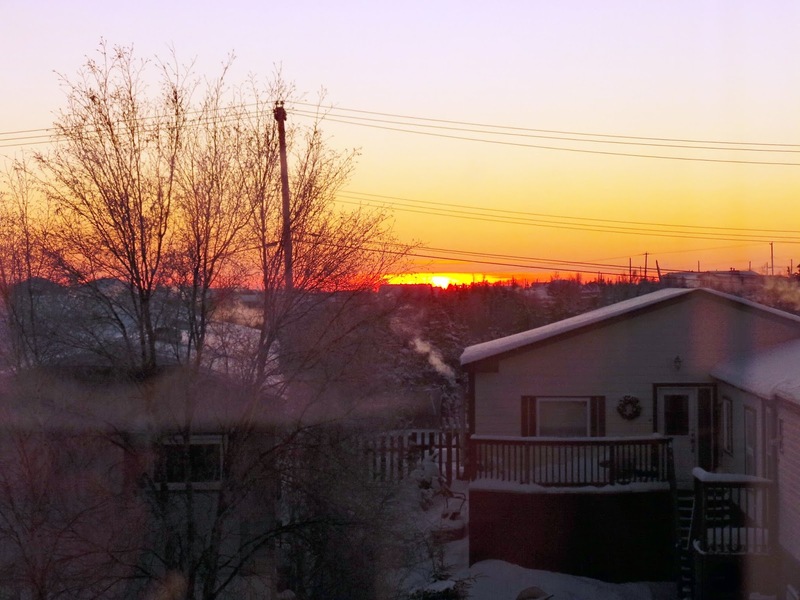 Being a small town there weren’t a lot of hotel choices in Yellowknife – a total of five. I chose the Super 8 even though it wasn’t one of the two “upscale hotels.” It had better TripAdvisor reviews and included breakfast. We weren’t disappointed. 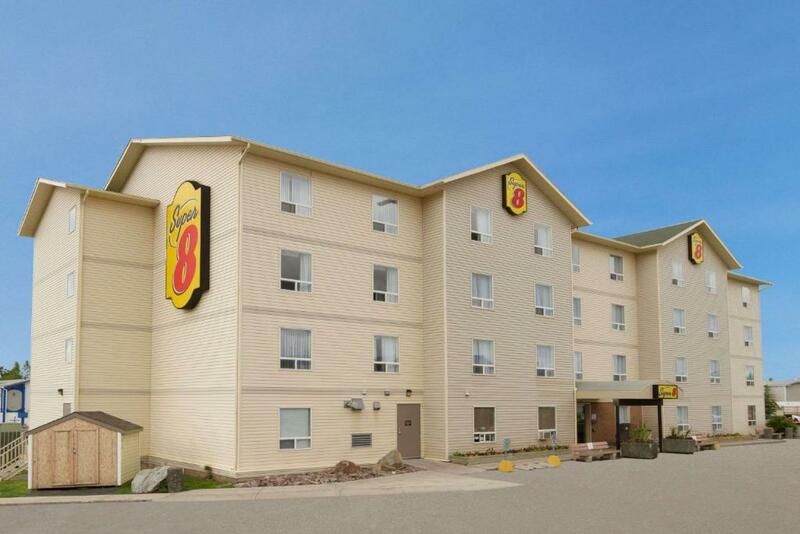 The room was large and clean and the staff was particularly friendly. After unpacking the first order of business was lunch. There were only fast food restaurants near us: Tim Hortons, Pizza Hut, McDonalds and Fatburger - We opted for Fatburger. 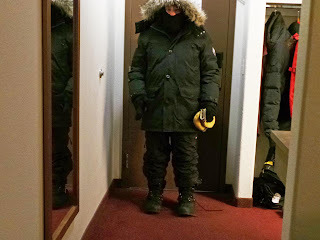 We didn’t put on our rented clothes but just the cold weather gear we were wearing – big mistake. Even though it was only a block away I was nearly frozen – particularly my face – by the time we got there. During the late afternoon, (the sun set around 4:00pm) the skies began to clear and it looked like we might have a good opportunity to view the Aurora. 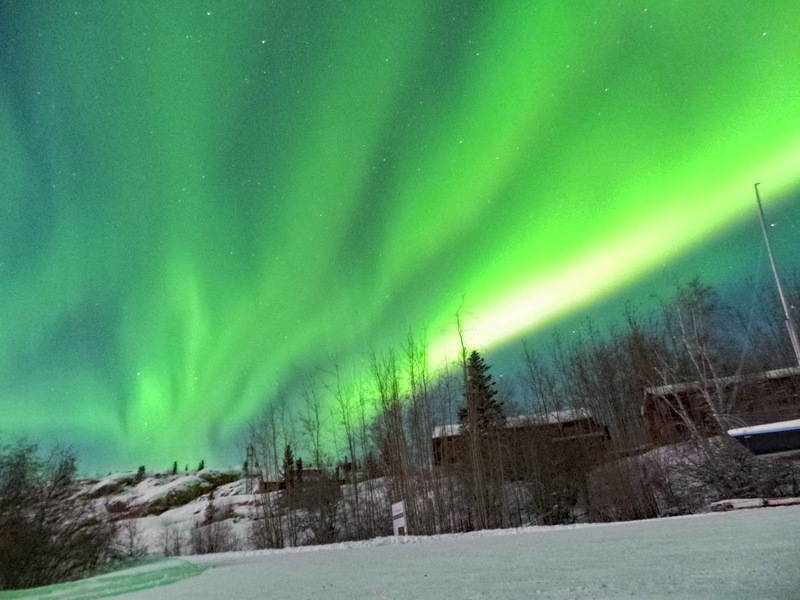 The prime Aurora viewing hours are between 11:00pm and to 2:00am. By the time Joe, our guide, picked us up at 9:30pm the skies were totally clear. That was the good news. The bad news is the temperature had dropped more until it was about minus 45 and dropping. That meant really dressing up warm. There’s a knack to dressing for cold weather – the secret is layers – lots of layers. I’ve hired a professional model to demonstrate. The first layer is light thermal underwear and socks. Followed by a heavy t-shirt…. … and a light sweatshirt. And finally the heavy quilted snow pants. After the pants it’s time for some heavy socks that can be pulled up over the bottom of the pants. After the socks, it’s time for the foot warmers. These attach to the bottom of your socks. They only go up to your toes. If you want to keep your toes warm, then you also need to add the toe warmers. I was a little leery of using those chemical footwarmers due to an unfortunate incident my old writing partner some years back. He was complaining about cold feet during a cold snap and decided, rather than spend the two dollars on footwarmers he’d do it himself. He put a heaping tablespoon of cayenne pepper in each of his socks before he headed off to an important meeting we had with prospective clients. Part way through the meeting he began to sweat profusely, then his legs began to vibrate. Needless to say the meeting ground to a halt as we all watched this bizzare performance. A few moments later he jumped up and began to run to the door. I ran after him to see what was wrong. All I saw was a shoe part way down the hall, then another shoe. I followed the clothing trail to the staircase where I saw one sock part way down the stairs and another on the landing. When I went outside, I saw him jumping up and down in a snowbank. When I looked up I saw our prospective clients faces pressed to the window. Needless to say we didn’t get the gig. So I was a bit concerned when I fastened the footwarmers to my socks and stuck them in my boots. But they worked well. They lasted all night. In fact they were still warm the next morning. After the socks, it was time for the snowmobile boots. These had felt liners that added additional protection against the cold. I ended up renting boots that were a size bigger than my shoe size to accommodate all the extra socks and warmers. To keep my face warm I put on a balaclava – which also could come in handy if I ever decide to rob a bank. …and finally the fur trimmed parka. On my hands I had fingerless wool gloves covered by heavy mittens. I found the fingerless gloves worked well when I was taking pictures. I also had hand warmers that I kept in my parka pocket. Now you may think the above may have no practical use for you; but I beg to differ. This method would be of great use for you when travelling on budget airlines where they charge you for checked bags – just wear all your clothes! Around 9:30 the bus showed up. The skies had totally cleared and there was a three-quarter moon in the sky. Despite the fact that the bus’s heater was going full blast the windows were frosted over and you could feel the cold seeping through the floor. Both or driver, Joe, and guide Tracy, were from China. Evidently a high percentage of northern light tourists are from Asia. Luckily both spoke excellent English. Tracy explained to us that we were going to be viewing the lights (if they appeared) from various locations. The first location was about 15 minutes away from the hotel. Tracy got out of the bus to check things out and returned with a big smile to announce that we were lucky. The Aurora gods were smiling upon us. We exited the bus and looked expectantly in the sky. Above us and to the north was a light coloured band of light – almost like the milky way on a clear night, but fainter. As our eyes adjusted to the dark the band seemed to undulate and move. I set up my camera on a small tripod on a small hill and set up for a time exposure. As soon as I pressed the shutter and stepped back the tripod and camera took off down the road like a bob sled. I had to chase it for a bout 50 meters till I caught up with it. Our guide set up her camera in a more secure place and took as many pictures of the aurora as we wanted – no extra cost. One thing we noticed after looking at the pictures from the first site was the camera caught far more of the colours and details than the naked eye. That is if you camera wasn’t a iphone. For some technical reason the iphone’s camera didn’t capture the lights in any detail. Those with a camera or Samsung phone got the best results. For camera buffs, the best results were attained with setting the ISO to 1800, opening the aperture to 2.8, and about a 10 to 15 second exposure. Don’t even try taking pictures if you don’t have a tripod – all you’ll get is a swirl of color. After about 15 minutes we’d had as much cold as we could stand and retreated to the relative warmth of the bus. 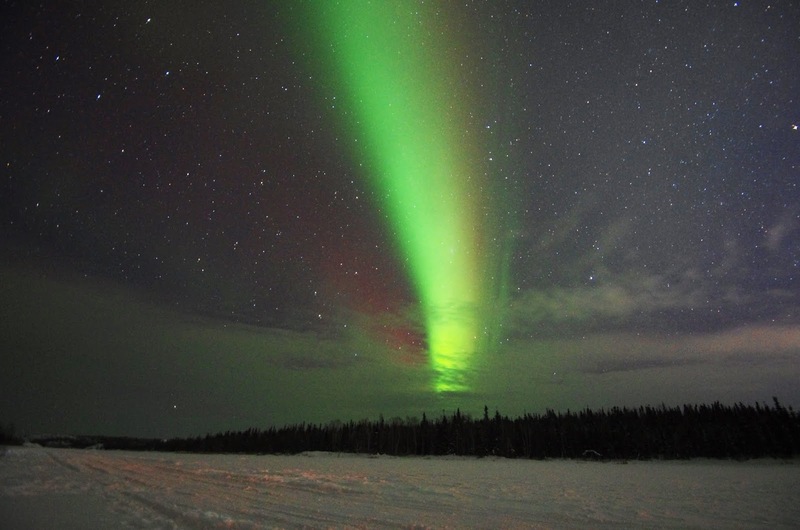 We then headed off to the second location – on the shores of the Great Slave Lake for the second viewing. We arrived around 11:00pm and when we exited the bus our jaws dropped. The lights had intensified and were dancing across the sky. We were on the edge of a large frozen lake, there were boats pulled up beside us, and a huge expanse of sky in front of us. A truly fantastic site. After half an hour the cold overcame our excitement and we all retreated back to the bus to warm up. We visited two other sights, but the lake sight was undoubtedly the best. Around 1:00am we headed back to the hotel. Tracy transferred the photos directly to those who had iphones and emailed a link to those of us who didn’t. Back at the hotel it was time for a cup of hot chocolate and bed. Although we didn’t get to bed until after 3:00am, we were up early to cash in on the included free breakfast – which wasn’t bad for a second tier hotel. Waffles, boiled eggs, bagels, cereal. I’ve had far meagre “continental” breakfasts at expensive hotels. While we were eating a tour arrived from Guadalajara, Mexico where the lowest it ever gets is 6 above. Boy, are they in for a surprise! We sat across from a local school temperature who admitted the weather was cold – even for them. 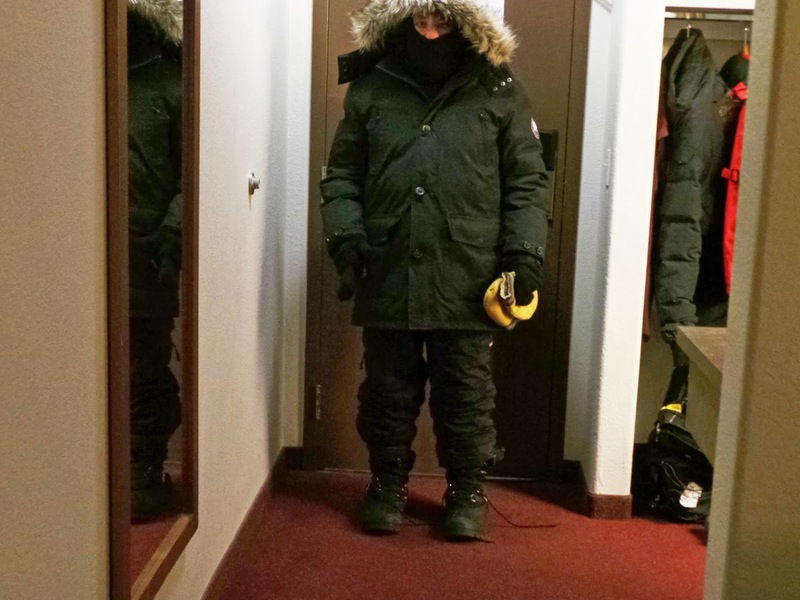 She remembers once when it was minus 60 and her eyes froze when she crossed the street. She was out less than a minute. “What’s it today?” I asked. Around ten o’clock there’s a knock on the door. It’s Tom. “It’ll be an adventure,” he replies. “We’ll be back in a couple of hours,” Tom assures me. Michele and I spend a quiet day in our room. I’m excited about seeing the Aurora again that night. I looked at the previous night as a dress rehearsal. I reviewed all the pictures we took and figured out how to even do better tonight. Around 4:30 in the afternoon there’s a knock on the door. It’s Tom. “I just thought I’d tell you we’re back,” he announces. “Well Fen and I decided to take public transportation. There’s a bus stop right across the street. We only had to wait twenty minutes for one to come by. “Twenty minutes in minus thirty? “So what did you do then?” I ask. “You had to take two buses to get downtown?” I ask incredibly. Joe and Tracy show up around 9:30 and we dash into the bus. This time we’re experience watchers so we grab the seat with the heating vent. The windows are totally frosted over so I can’t see where we’re going. After fifteen minutes Tracy announces that we’ve arrived at the first site and she’ll go out and see if the Aurora is visible. After a few minutes she gets back on the bus and announces that the Aurora hasn’t started yet. So we’ll just wait for a few minutes and check again. After half an hour the Aurora is still a no show so Tracy announces we’re going to drive to another spot – maybe they’ll be there. We wait about half an hour and then move on to the next site and then a fourth – same story. Finally around 1:00am Tracy admits what’s become obvious to all of us on the bus – the Aurora is a no show tonight. While I’m disappointed that I didn’t get another chance to see them, I’m buoyed by the fact that we had a great show last night. In the morning we have a late breakfast, pack up and head off to the airport and home. If viewing the Northern Lights isn’t on your bucket list, it should be. 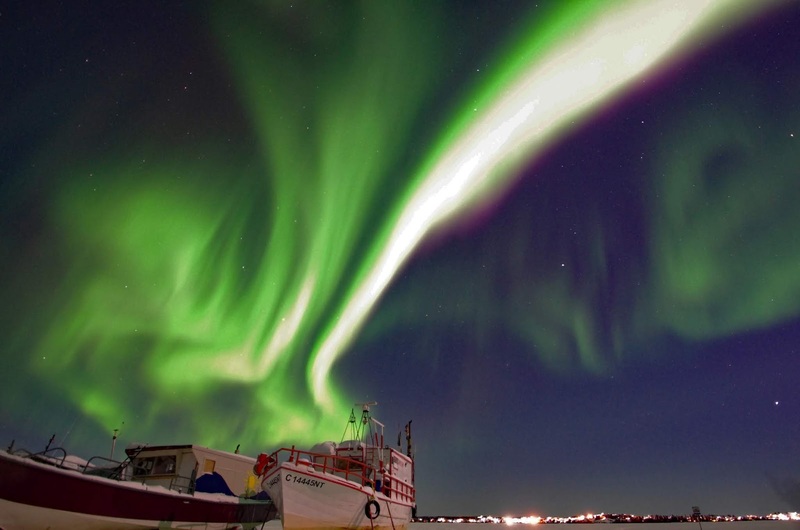 You don’t necessarily have to view them from Canada, you could tie in viewing with a trip to Norway, or Iceland or many other northern countries. Just make sure you book three nights – that way you’re pretty much guaranteed to see them on at least one night. In two weeks I’m moving from one extreme to another. From 40 below to 40 above as I head of to Botswana for a safari.